The Australian Energy Market Commission’s (AEMC) latest grid performance report found the “unprecedented change” caused by an increasing level of wind and solar power has forced the power system to change faster than expected and that it was failing to keep up. 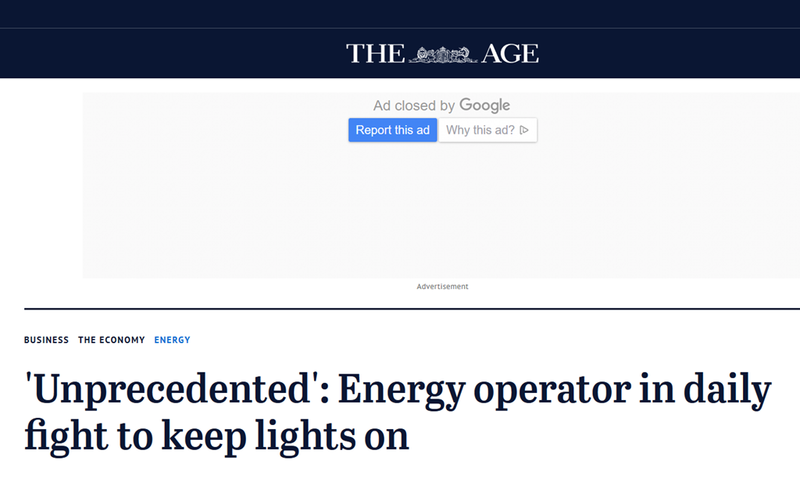 The AEMC said the Australian Energy Market Operator (AEMO) has had to step in more frequently to keep the grid stable. “The grid is holding up but only because the energy market operator is intervening on a daily basis to keep the lights on,” the AEMC said its 2018 Annual Market Performance Review, released on Thursday. The grid instability is being caused by less predictable, intermittent wind and solar power flowing into the network coupled with less reliable coal-fired power stations. The AEMC said the power system’s built-in safety nets were being used on a regular basis to combat the grid’s instability. The safety nets include calling on big energy users like smelters and manufacturers to power down to reduce electricity demand, curtailing wind and solar power when it over-produces energy or forcing generators to push more electricity into the grid during peak demand periods. The grid is holding up, with some more intervention than we want, but these problems aren’t insurmountable. A number of safety nets were used in January, in Victoria, when a combination of coal-fired power station failures, wind farms running below capacity and record high temperatures forced AEMO to carry out rolling blackouts across the state to keep the grid from failing. More than 200,000 Victorian households had their electricity temporarily cut while manufacturer Alcoa was forced to power down its Portland-based aluminium smelter. The AEMC said the continual use of security safety nets is costly and would mean the historically high power prices would likely not fall. “These emergency, expensive ‘stop-gap’ measures are not meant to be used all the time,” it said. The AEMC said this could be alleviated by investment in more generation and back-up power for intermittent renewables. “We have been saying for some time now we need an integrated emissions and energy policy,” Ms Pearson said. “Our market needs investment in generation to drive down prices [through more power supply], and private investment needs certainty for this, the best way to drive down prices is to give certainty through policy." Investment in renewable generation is expected to hit $20 billion in 2018 and 2019 but slump from 2020 onwards. Ms Pearson added that the increasing intervention in the grid should not raise concerns of more blackouts. “This power system is under pressure but, by-and-large, reliability is being maintained, the lights are staying on,” Ms Pearson said. AEMC chief Anne Pearson talks about investment in more generation, but investment in renewables will only make matters worse. They are the problem, not the solution. She also displays the same apathetic attitude to future problems, as we see in the UK with our own National Grid. They are operating to a political, climate agenda, which does not allow them to voice the real problems or criticise their masters’ renewable policies. To put Australia’s problems into perspective, wind and solar only account for 8% of their electricity generation. Will Ms Pearson’s grid still be holding up when this figure doubles or quadruples?